How do I create a new archive location, or choose another one? Close MailStore Home completely. You can verify if the application is really shut-down by using the Windows Task Manager. Once the application is launched, you will see the following dialog called ‘MailStore Home’. In the dialog you can choose the new location and save it. If you want to create a new archive location, click on . A dialog opens and shows a list of folders. Here you can create a new folder to store the new archive. It means that from that point in time onwards MailStore Home will include and save all MailStore databases and archives in that location. 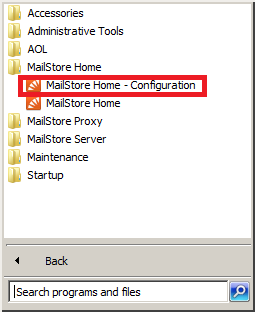 You can now close this application dialog using (“Quit”) or start the application MailStore Home (“Start”) again. Product Version: v9 and up.